Last Tuesday 5 June was World Environment Day. So, I thought I'd take the opportunity to find out what most people do to try to limit their impact on the environment. I'm happy to report that, according to my highly rigorous and scientifically valid survey (okay, twitter), we are all making significant changes to our lives — both in terms of daily habits and big lifestyle choices — in order to try to protect our planet. To give you a feel for the responses, I'll group them into a number of key themes. The first is consumption. People are consciously reducing their consumption, avoiding 'fast fashion' and meat, and trying to buy locally or only second-hand. Right on theme for this year's World Environment Day, people are also focused on eliminating their use of single use plastics by avoiding excess packaging, and bringing their own containers, water bottles, keep cups, and shopping bags. Recycling is also a big theme, including composting, worm farming, and donating clothing. And, finally, people are taking steps to reduce their water and energy consumption — moving into smaller housing, ditching their cars (or using them as little as possible), installing insulation, using solar power and energy efficient appliances, and avoiding the clothes dryer. To add a bit more rigour to this analysis, these responses also reflect many of the 'climate solutions' identified by Drawdown as being worth taking due to their impact on both emissions and environmental and community amenity. All this being said, the fact is that people remain frustrated by the limitations of individual action and are clear that there is a pressing need for structural and systemic change. While walking and riding to work is worthwhile, inner city living is beyond the means of many people, and public transport options need improvement. Inner city residents in turn would like to grow their own food, but have little space to do so, and there are challenges with gardening in communal spaces, including finding appropriate locations and dealing with issues of soil contamination. Other people identified big steps that they'd like to take — such as going off-grid or building passive solar housing — if only they had the money. It is also challenging to avoid plastic packaging when it is so ubiquitous, and hard to efficiently heat and cool many rental properties. "Australia is the third fastest growing vegan market in the world, and the roughly two million Australians who have adopted a plant-based diet are now thought to pose a genuine threat to the nation's meat and dairy industries." Faced with these structural barriers to change, the question naturally arises as to which actions we can take that will have the most significant impact. And, as it turns out, recent research published in Science has concluded that the most powerful individual action we can take is to make the switch to a plant-based diet. 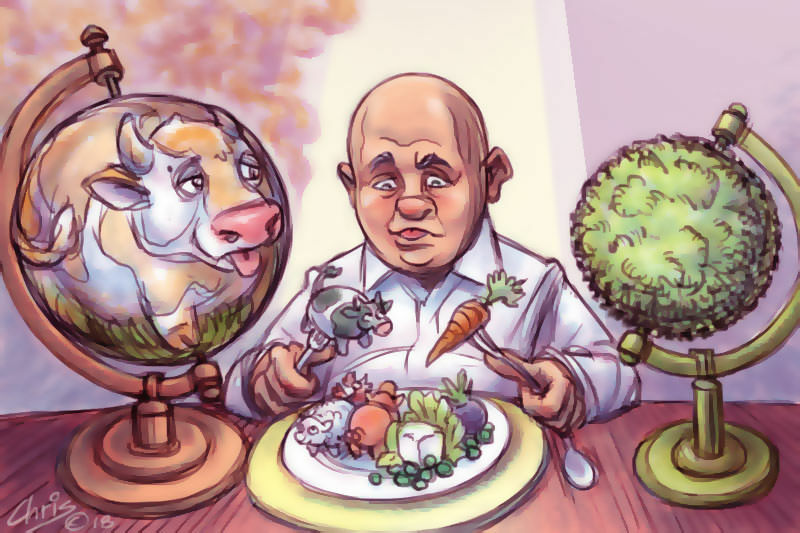 After examining five key environmental impacts — land use, climate change emissions, air pollution water pollution, and freshwater use — researchers from Oxford University and Agroscope, Joseph Poore and Thomas Nemecekd, concluded that consumers have significant power to 'deliver environmental benefits on a scale not achievable by producers' simply by excluding animal products from their diets. According to their findings, which were based on a survey of 38,700 farms and 1600 processors, packaging types, and retailers, the global adoption of a vegan diet would result in a 76 per cent reduction of agricultural land use for food production, a 49 per cent reduction of emissions, 50 per cent reduction of air pollution, 49 per cent reduction of water pollution, and a 19 per cent reduction of freshwater withdrawals. Poore and Nemecekd describe these benefits as transformative. Interestingly, this report comes at a time when the uptake of veganism is growing significantly, both globally and in Australia. According to some reports, Australia is the third fastest growing vegan market in the world, and the roughly two million Australians who have adopted a plant-based diet are now thought to pose a genuine threat to the nation's meat and dairy industries. This perceived threat is considerably heightened when it comes to vegan activists. No longer content to take over the world with cupcakes, many vegans have started to take a more radical approach. On 28 April 2018, several thousand vegan activists marched through Melbourne's CBD to draw attention to the ethical issues associated with animal agriculture. There has also been an increase in direct actions such as farm and abattoir lock-ons. While the focus of many vegan activists is on the ethics of the industry's commodification and treatment of animals, environmental issues also feature in these campaigns and in the motivation for many people's decision to take action. As several vegans explained to me, the protection of the planet is fundamental to protecting both humans and animals. While it's true that not everyone feels ready to make the switch to a plant-based diet, it is interesting to consider the choices so many are making to help protect the planet. Many of these actions would have seemed too hard not long ago. So, maybe the same will be said about adopting a vegan lifestyle in the not-too-distant future? I'd have imagined that if people in Australia were changing their dietary habits it would be due more to health and fitness considerations than ecological ones. Even small steps like limiting meat and dairy intake to fewer days per week would be a good start! Methane from cattle is one of the major contributors to the greenhouse effect implicated in climate change. Vegetation is the major absorbant of carbon dioxide the other major contributor to the greenhouse effect. If we ate more cattle, and less vegetation we would make a major contribution to lessening climate change if logic still exists in this world. Veganism is a little extreme and probably not a healthy option for most people. Environmentally, there is sustainable fishing, there are large parts of the country unsuitable for agriculture but will support goats and sheep. The vegans will want fruit, and if you have a good sized orchard you can also have chickens in it, producing eggs, fertilising the soil, and providing eggs and meat. I think the best advice is still to: eat food, not too much, mostly plants, local and organic if you can get it. Russell, eating vegan has kept me healthy for almost thirty years ( with ten years vegetarian eating before that). I find it a very healthy option. One of the disadvantages of eating cattle and sheep is the damage that these hard-hoofed animals do to Australia's fragile soils. Surely, Janet, if we ate many more cattle and sheep seriously reducing their numbers, there wouldn't be as many hard hooves damaging our fragile soils! I wonder if Christ was a vegan. I doubt it, because when he created us in his image he gave us the enzyme systems, absorptive and tissue generating capacity designed to utilise protein, carbohydrate and fat. He even designed our teeth to be incisors for eating meats and molars for crushing grains and other vegetation. Human beings are both carnivores and herbivores - indeed a weird mob. Janet, it works for you, it didn't for me (a lifelong vegetarian). Anecdotes are good, but most dieticians would say a diet with a little fish, chicken and meat in it is preferable. Humans can survive on almost anything, but we have evolved eating a mostly mixed diet. We have large numbers of sheep in Australia because we export millions of the things, but we could feed ourselves with fewer animals doing minimal environmental damage. Are you advocating people giving up cats and dogs as pets and just satisfying themselves with a budgie? Russell, if you wish to introduce the topic of pets into this discussion, perhaps you would consider if you know what is in the pet food people buy in supermarkets? It is worth exploring. As for budgies, a bird in a cage is a sad sight. As for individual human diets, yes, each of us needs to choose the diet for ourselves that is most healthy for us and for the planet. That might not mean veganism for all, I can accept that. I think the idea has merit from the Ecological and Climate Change perspective, as cattle, sheep, goats etc do contribute a lot of methane , a greenhouse gas to the atmosphere , particularly from feed lots. Animals are very inefficient users of the earth's resources which are very finite. The clearing of forest/scrub for grazing has been a part of Australian land practice since European settlement . This can only have a negative impact . Note that the clearing of Amazon Rainforest at the rate of a football field an hour for the production of beef for American hamburgers would had to have been the most irresponsible action I can recall! However ….humans are omnivorous animals .We have evolved partly as carnivores as brain development requires a lot of protein not found in a concentrated form in plants. However as others have commented moderation in all things including meat . I think that we in the West consume far too much meat and too much of anything is unhealthy. We should certainly reduce our meat intake. I am sure we will be the better for it but total abstinence - not really! Thank you for your excellent article, Cristy. It made me feel a little more positive about the future of our planet. Veganism is certainly on the rise among younger Australians and I really admire their commitment to a diet that can be quite challenging to maintain. I don't believe it's at all extreme - just a humane and intelligent response to a multitude of environmental and animal welfare issues. Pescatarianism - my personal choice - is tough enough. Good on those who are taking that extra step for the sake of future generations. Vegans cause further environmental damage with their emphasis on the use of synthetic clothing and chemical products and their objection to the control of feral animals which decimate the population. Much of the land used for animal production in Australia is not suitable for crops, fruit, or vegetable production. This article is just more propaganda without any analysis of the statistics. Perhaps we can dispense with beef for its production of methane and the land expanses needed to run cattle. But this still leaves us with the possibilities of eating chicken, pork and fish as they require smaller areas for production. We still need sheep, if not for meat then for wool. I try to buy cotton and wool products (natural fibres) when and where I can. But everything comes with its own problems and at a price. Cotton takes massive areas of land and water to produce, and as a mono-crop destroys plant diversity. And I love my dairy - milk, butter, cheese and yoghurt - so dairy is still in for me. Veganism seems extreme to me.